Our Surrey dentists have compiled this Dental Health Library to provide our patients with a comprehensive online resource for all things oral health. Periodontal procedures, such as soft tissue grafts, are available to stop further dental problems and gum recession, and/or to improve the aesthetics of your gum line. Non-surgical periodontal therapy removes plaque and calculus by controlling the growth of harmful bacteria and by treating conditions that encourage gum disease. Occlusion refers to the alignment of teeth and the way that the upper and lower teeth fit together (bite). Ideally, all upper teeth fit slightly over the lower teeth. Malocclusion means the teeth are not aligned properly. Dental sealants are thin plastic coatings that protect the chewing surfaces of children's back teeth from decay (cavities). A crown is a type of dental restoration which completely encircles remaining tooth structure or a dental implant. As far as a dental restoration goes, the terms "crown" and "cap" are synonymous. Crowns are synthetic caps, usually made of a material like porcelain, placed on the top of a tooth. Among the most common, irritating and difficult to diagnose problems with head and neck pain are temporal mandibular joint problems, more commonly known as TMJ problems. Periodontal procedures, such as crown lengthening, are available to lay the groundwork for restorative and cosmetic dentistry and/or to improve the esthetics of your gum line. When the pulp, or soft inner tissue, of a tooth becomes infected, it can be extremely painful, and if left untreated, can result in the loss of the tooth. Dentists perform root canals to repair the damage and save the tooth. Combined with brushing, flossing is a very important daily step in maintaining good oral hygiene. A "toothache" is pain typically around a tooth, teeth or jaws. In most instances, toothaches are caused by a dental problem, such as a dental cavity, a cracked or fractured tooth, an exposed tooth root, or gum disease. 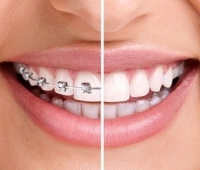 Orthodontics is a type of dentistry focused on the correction of improper bites and tooth irregularity. The most common form of orthodontic treatment is braces. The dental bonding procedure utilizes a composite resin and is used for a variety of structural as well as cosmetic purposes. One can draw a parallel between dental bonding materials and a sculptor's clay. Periodontal treatment guidelines stress that periodontal health should be achieved in the least invasive and most cost-effective manner. This is often accomplished through non-surgical periodontal treatment. Used by dentists for more than a century, dental amalgam is the most thoroughly researched and tested restorative material among all those in use. Tooth decay, known formally as dental caries, has been a serious health problem for all nations since time immemorial.